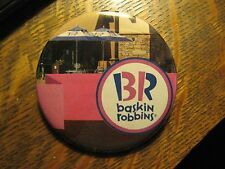 brand new BASKIN ROBBINS 31 (Ice Cream) T-Shirt - with image of "Basking Robins"
Baskin Robbins Ice Cream Stickers I Love BR 31 Free Shipping!!! Vintage Original Baskin Robbins Stainless Steel Ice Cream Scoop 2-3/8"
Vintage Original Baskin Robbins Stainless Steel Ice Cream Scoop 2-1/8"
This page was last updated: 21-Apr 10:11. Number of bids and bid amounts may be slightly out of date. See each listing for international shipping options and costs.